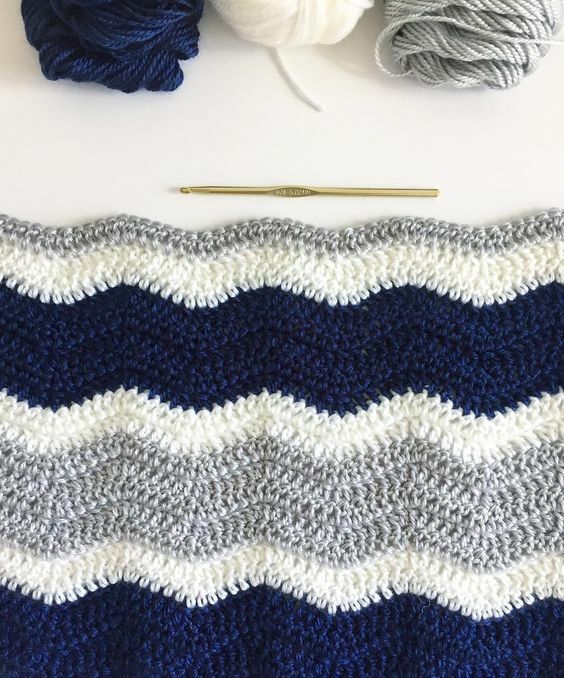 At this point I have made a dozen or so crochet ripple blankets, aka chevron, and there are so many ways to make the peak and make the valley. I like the way this version doesn’t leave holes. Sometimes holes are good! 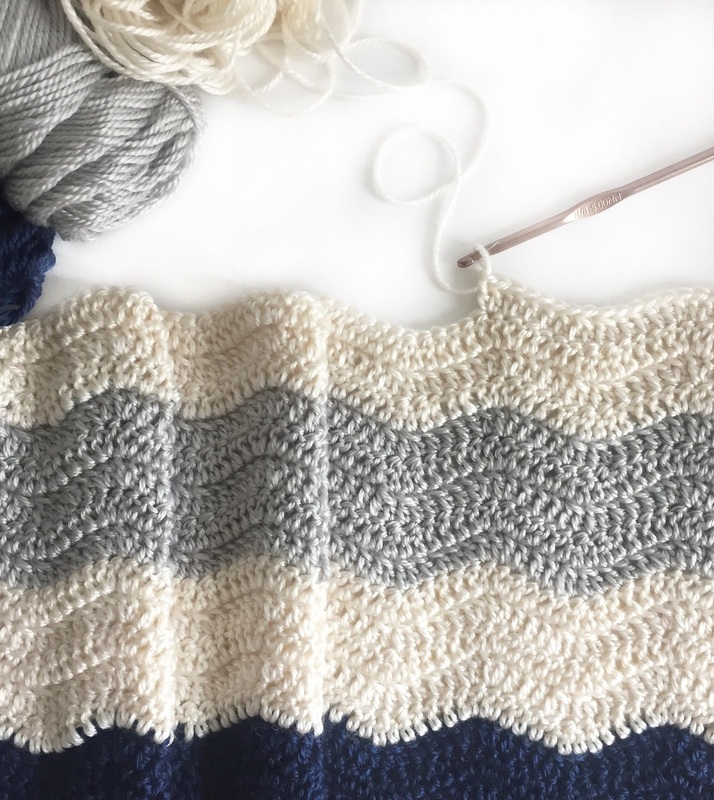 They add to the look of the pattern, but for this blanket, I wanted the look to be smooth and flowing, like ripples! CH a multiple of 12 + 3. I usually make my blankets 32-36 inches wide. About that high as well. Row 1: DC in 4th chain from hook, first three chains counts as a DC. *1 DC in each of the next 3 CH, DC2TOG twice, 1 DC in each of the next 3 CH, 2 DC in next CH twice, repeat from * across to the last CH, 2 DC into that last CH. Row 2: CH 3, DC in that next stitch, (if you count down from the hook it will be the 4th CH) *1 DC in each of the next 3 stitches, 2DCTOG twice, 1 DC in each of the next 3 stitches, 2 DC in the next stitch twice, repeat from * across to the last chain, 2 DC into the top of the CH 3 turning chain from the previous row. REP row 2- over and over. This is a fairly common pattern, I’ve seen it lots of other places and a good one to practice over and over to get comfortable finding the top of that dang turning chain! Keep it loose and try your best to go under both loops of that chain. It helps to make the sides very straight. Also, this ripple is pretty easy to keep track of your place. 3 DC separate each peak and valley. 2 DC on each end. Keep that in mind as you go and you’ll do great! Don’t be afraid to take out mistakes, it’s not as long to make them up as you think. I had to learn that the hard way. Sometimes I’m going along and I think that I can make up for the missed stitch or the extra I put in between the peak and the valley, it’s not worth it-even though it is so tempting! Just take it out and start over. Your blanket, in the end, will thank you! As always, I love seeing what you make. I really do. Instagram is the easiest place to tag me or post under #daisyfarmcrafts. Don’t have Instagram? It’s a really fun place for crocheters so I highly recommend that you start one! Everyone shares everything and there are so many great ideas. Find me @daisyfarmcrafts.